With Trump, is there a line between business and government? The idea of a Donald Trump presidency has me musing about what we were supposed to learn in school. We were taught that capitalism (the force that always wore the white hat) was good because the invisible hand of competition ensured that consumers always had choice and low prices while good businesspersons made money. What capitalism did not need was government getting in the way. Capitalism was good when left unfettered. Socialism was generally painted in a negative light because it was such a close relative to communism. And communism was that force that spread red ink all over the world as it emanated from the Soviet Union and flowed every direction but north. It would envelop us unless we stopped it. So even if socialism was a system that was designed to put the common good above individual profit, it received short shrift because of the company that it kept. How things have changed. Russia (the distilled version of the old Soviet Union) is now very much in favor with Donald Trump. In fact, he and Vladimir Putin must be BFFs on some hidden Facebook page. In the 1950s, Soviet leader Nikita Khrushchev said, “we will bury you” to the Americans. It seems that Putin is silently saying “we will co-opt you” as he manipulates our cyber system and invites American businesses like ExxonMobil to do some heavy lifting in Russia, with Putin always having the phrase “nationalize it” going through his mind. 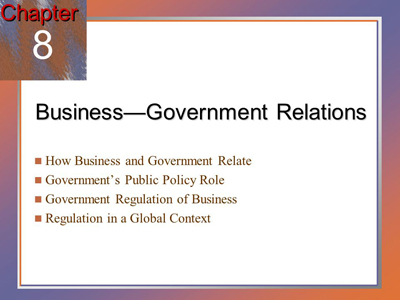 I remember some fifty years ago taking a course in college called “Business-Government Relations.” I was excited about taking it because in my naiveté, I thought that no one ever connected to two and it would be interesting to see how some professor might explain whatever relationship existed. I think that I learned better than any previous high school history course that there was constant tension in America between business and government. For most of the first half of our nation’s history, business had been able to run free in whatever fashion it wanted to, whether it was taking land from Native-Americans, hiring workers for pittance pay and with little regard for safety, and the creation of monopolies being just fine because Darwin had already taught us of the genius of survival of the fittest. But concern over monopolies grew at the end of the 19th Century and Congress passed the Sherman Anti-Trust Act that put a curb on some of the unfettered capitalist practices. As the 20th Century opened, the Progressive Era began with President Theodore Roosevelt. More progressive legislation was passed in the administration of Woodrow Wilson. Then we had FDR’s New Deal and LBJ’s Great Society. All of these eras brought us reasonable restraints upon runaway Capitalism. The dialogue that we are not having now is what principles should guide the relations between businesses and government. It is de rigueur for businesses to ask various levels of government for tax breaks, subsidies, regulation wavers and anything else that can lower their cost of doing business. It is truly a free market system for businesses as they can shop from country to country, state to state, metropolitan area to metropolitan area, municipal tax authority to municipal tax authority to get the best deal. It is truly a race to the bottom for all levels of government to see who will give the most to expectant businesses. Trump clearly wants to bring us back to more of an unfettered capitalism. He proposed Secretary of Labor, Andrew Puzder, is opposed to most of his bureau’s regulations regarding wages, safety, and union organizing. He envisions his main constituency becoming robots rather than human beings in the labor force. Administrator of the Environmental Protection Agency (EPA) Scott Pruitt does not accept climate change and seems comfortable with businesses not having to curb their activities because some scientists think that emissions from fossil fuels causes climate change. Trump and other Republicans railed through the campaign complaining about regulations without ever asking the question of why we have them. From the pure capitalist’s point of view, they only exist to hamper businesses. There was a time when Republicans said that we have to get rid of “bad regulations” but now it seems like all regulations are on the chopping block. Democrats are not always perfect on these issues, but at least they recognize that worker safety, environmental considerations, consumer safety and assurance of competition are all considerations to be weighed against the interests of any single corporation or industry. Lyndon Johnson used to say, “Let us reason together.” He actually meant it. By the way, what did Donald Trump learn at the University of Pennsylvania’s Wharton School of Business? Was the word “balance” ever uttered? Is that why “unbalanced” is one of the best ways to describe his administration? Next Post:Rex Tillerson: What does he really think about climate change? Who knows?